Some of Branson's most luxurious homes can be found at Grandview by the Lake. 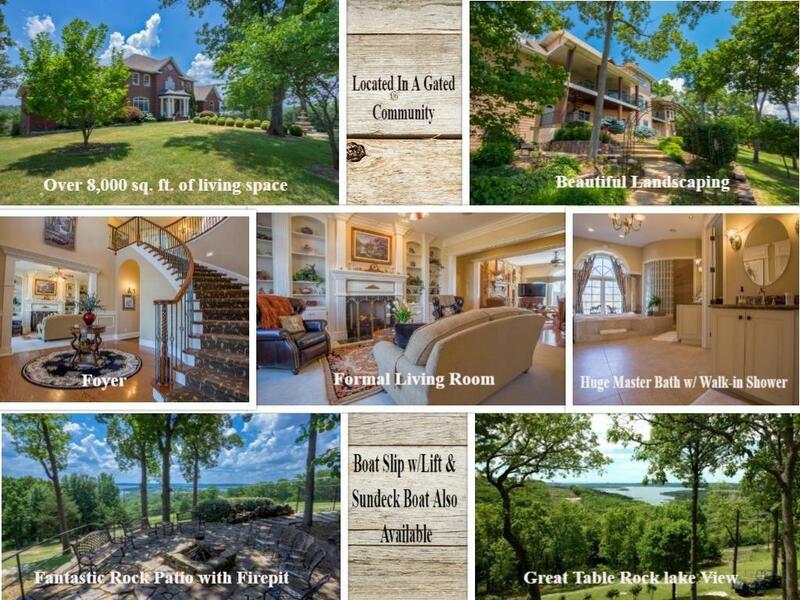 Truly breathtaking Ozark Mountain lake views are found here as well, as this neighborhood is on the eastern shore of Table Rock Lake which includes all underground utilities along with community water and sewer. Luxury homes for sale inside this beautiful gated community come in a wide array of styles, including cottage, colonial and huge contemporary mansions. Just outside of the gated entry resides all you could ever need, from nearby professional services to hundreds of shops, restaurants, and theaters that make Branson so famous. For those with families, you can trust the award winning Branson School District to make your child's education a top priority. Being so close to Table Rock Lake provides Grandview By The Lake residents easy access to boating, swimming, and fishing opportunities. Boat slips are for sale in the surrounding neighborhoods as well as for lease at nearby State Park Marina. Also close by, are Lake Taneycomo and the Mark Twain National Park, both catering to those seeking further outdoor adventures. Often there are Grandview by the Lake vacant lots for sale too if you're looking to build a new construction home. Want a copy of the neighborhood property restrictions? My name is Charlie Gerken and I'd like to show you everything available in Grandview By The Lake in Branson, Missouri. Please contact me for a showing of this Table Rock Lake view neighborhood.